PD-1 pathway. MHC molecules expressed by tumor cells, antigen-presenting cells (APCs) and other immune cells present antigen to T cells. Subsequent activation of the T-cell receptor complex results in expression of PD-1 receptor on the T-cell surface. 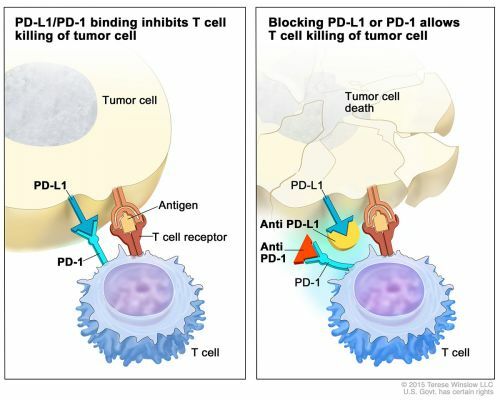 PD-L1 and PD-L2 ligands on APC׳s and tumor cells may then engage the PD-1 receptors resulting in suppression of T-cell mediated immune response. 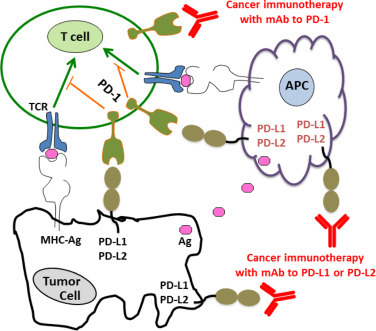 Antibody-mediated blockade of the PD-1/PD-L1 pathway may, therefore, enhance antitumor immunity. Immuuntherapie met een combinatie van nivolumab en ipilimumab geeft hoopgevende resultaten bij gevorderde uitgezaaide blaaskanker met een overall response van 26% tot 38% response (Partiële remissie = PR = gelijk aan of >50% minder tumorload en Complete Remissie - CR = complete response = klinisch tumorvrij). Alle patiënten hadden minimaal al 1 chemokuur maar de meesten meerdere chemokuren gehad. Maar ook immuuntherapie met alleen nivolumab zorgde voor hoopgevende resultaten bij gevorderde uitgezaaide blaaskanker met een overall response van 26% (19 uit 78 patiënten) met 6% complete remissies (5 uit 78 patiënten) . Deze studieresultaten werden gepresenteerd op het 2016 Society for Immunotherapy of Cancer (SITC) Annual Meeting in National Harbor, Maryland. “Tot het eerste moment dat een checkpoint remmer officieel toelating kreeg hebben blaaskankerpatiënten de laatste 30 jaar geen nieuwe verbeterde behandeling aangeboden gekregen. Wij bewegen nu snel toe van enkelvoudige checkpointremmers naar combinaties van verschillende anti-PD medicijnen als immuuntherapie voor blaaskanker met verbeterde overall overlevingskansen.” zegt studieleider Padmanee Sharma, MD, PhD, Professor of Genitourinary Medical Oncology and Immunology at The University of Texas MD Anderson Cancer Center. Deze gerandomiseerde fase I/II CheckMate 032 studie onderzoekt een behandeling met verschillende doses van zowel nivolumab als van ipilimumab (LET OP: hoe hoger de dosis en hoe meer medicijnen gebruikt moeten worden hoe meer het farmaceutische bedrijf eraan verdient). Patiënten die de combinatie van nivolumab en ipilimumab met de hoogste dosis van ipilimumab kregen teogediend hadden de hoogste objectieve respons (38.5%). Combinatie van 3 mg/kg van nivolumab en 1 mg/kg van ipilimumab gaf een 26% overall response te zien waaronder 3% complete remissies. Een behandeling met alleen nivolumab resulteerde in een 24.4% overall response waaronder 6% complete remissies. Combinatie van 3 mg/kg van nivolumab en 1 mg/kg van ipilimumab resulteerde in een 26% (27/104) overall response met 3% (3/104) complete remissies. Een behandeling met alleen nivolumab resulteerde in een 24.4% (19/78) overall response waaronder 6% (5/78) complete remissies. Het studieverslag van de studie met alleen nivolumab: Nivolumab monotherapy in recurrent metastatic urothelial carcinoma (CheckMate 032): a multicentre, open-label, two-stage, multi-arm, phase 1/2 trial is gepubliceerd in the Lancet. Hieronder het abstract van deze studie. Few effective treatments exist for patients with advanced urothelial carcinoma that has progressed after platinum-based chemotherapy. We assessed the activity and safety of nivolumab in patients with locally advanced or metastatic urothelial carcinoma whose disease progressed after previous platinum-based chemotherapy. In this phase 1/2, multicentre, open-label study, we enrolled patients (age ≥18 years) with urothelial carcinoma of the renal pelvis, ureter, bladder, or urethra at 16 sites in Finland, Germany, Spain, the UK, and the USA. Patients were not selected by PD-L1 expression, but tumour PD-L1 membrane expression was assessed retrospectively. Patients received nivolumab 3 mg/kg intravenously every 2 weeks until disease progression or treatment discontinuation because of unacceptable toxicity or other protocol-defined reasons, whichever occurred later. The primary endpoint was objective response by investigator assessment. All patients who received at least one dose of the study drug were included in the analyses. We report an interim analysis of this ongoing trial. CheckMate 032 is registered with ClinicalTrials.gov, NCT01928394. Between June 5, 2014, and April 24, 2015, 86 patients with metastatic urothelial carcinoma were enrolled in the nivolumab monotherapy group and 78 received at least one dose of treatment. At data cutoff (March 24, 2016), the minimum follow-up was 9 months (median 15·2 months, IQR 12·9–16·8). A confirmed investigator-assessed objective response was achieved in 19 (24·4%, 95% CI 15·3–35·4) of 78 patients. Grade 3–4 treatment-related adverse events occurred in 17 (22%) of 78 patients; the most common were elevated lipase (four [5%]), elevated amylase (three [4%]), and fatigue, maculopapular rash, dyspnoea, decreased lymphocyte count, and decreased neutrophil count (two [3%] each). Serious adverse events were reported in 36 (46%) of 78 patients and eight (10%) had a serious adverse event judged to be treatment related. Two (3%) of 78 patients discontinued because of treatment-related adverse events (grade 4 pneumonitis and grade 4 thrombocytopenia) and subsequently died. Nivolumab monotherapy was associated with a substantial and durable clinical response and a manageable safety profile in previously treated patients with locally advanced or metastatic urothelial carcinoma. These data support further investigation of nivolumab monotherapy in advanced urothelial carcinoma. Reageer op "Immuuntherapie met nivolumab en ipilimumab samen geeft hoopgevende resultaten bij zwaar voorbehandelde gevorderde uitgezaaide blaaskanker"